Let’s face it – whether it’s at parties, fetes, Halloween or weddings, our children are ALWAYS drawn to Face Painters. We suspect they may have a sixth sense, or they know that as parents, we love nothing more than a long, gruelling queue. We have been to countless events where we have had to wait, whilst one Face Painter works his way through a succession of children, until finally, our beloved kids get their go. It’s normally at this point you realise that the face painter is nearing exhaustion, and his face paints have been getting progressively worse as he tries to see as many customers as possible. Now whilst there’s clearly a skill in painting intricate designs, you don’t have to be the Picasso of face paint to pull off some themes that your kids will love. 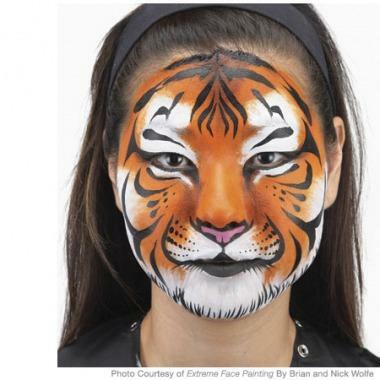 This article is your go-to-beginners-guide to face painting. It includes design ideas (with links to step-by-step guides), do it yourself tips (including the types of paint and utensils you’ll likely need), as well as some links for finding Face Painters in your local area. In the eyes of a child, face paint is magical. It is something capable of transporting them into a world filled with their favourite characters. Face paint has the ability of transforming quiet, reserved kids into a confident livewires in a matter of minutes – and that’s a powerful thing. Face painting is a great way of keeping children entertained – so if you’re struggling for new ideas – face painting is your answer. A face painting kit can be a great investment – you can take it from job to job and as mentioned, they guarantee happy and engaged children! What’s more, face painting is not weather-dependent; you can get the kids creativity flowing come rain or sun and if you’re feeling brave, you can test their creativity by letting them try on you – err, maybe not. Of course, you want children to look and feel amazing. But it’s important to be realistic when choosing your DIY design. You don’t want to promise the little ones something that a) will take too long and b) is too difficult to pull off. Kids love superhero face paints. Fact. Little beats the moment when a child sees their freshly-painted superhero face for the first time. They switch between looks of sheer disbelief and joy. Quickly followed by failed attempts to fly, shoot webs out of their wrists, and move objects with their now-almighty mind. Colours used – White, black, yellow and orange. Colours used – turquoise, teal, black (and glitter!). Colours needed – white, red, dark red (optional as only used for the scar). This design is slightly more complex, but follow the video carefully and you’ll have a terrifying zombie painted in no time! p.s. it is a scary design, so make sure your kids won’t freak out! Colours used – White, Yellow, Pale Green, Lilac, Dark Brown, Black, Burgendy (All Snazaroo colours). Click here to go to Snazaroo’s Princess guide. Chosen your design? Now onto painting it! There are so many different face paints out there, and it can get quite frustrating trying to decide which paint to buy. What type of face paint should you use? Firstly, it is so important to the use the right type of paint! Make sure the paint you’re buying has been specifically designed for the skin. Using any old paint can be extremely dangerous. Things such as craft paint, including acrylics, should not be used – they are not designed for the skin and can cause allergic reactions, which of course, isn’t good! We’ve all been there. The kids get their face painted at some event. You get back home. Announce that it’s time to say goodbye to Spiderman or Princess Elsa. What happens? All hell breaks loose. If there’s one thing kids do not like, it’s being told that their new appearance is going to be wiped from existence by their parents. It’s for this reason we recommend water-based paint. It’s so quick and easy to wash off, there’ll be no time for the kids to run away! Snazaroo is one of the world’s leading face paint brands. They have massive customer loyalty and put a huge emphasis on producing the safest paint on the market. All of their face paints are water-based, meaning they’re super easy to use, and even easier to wash off. Individual 18ml pots for £4.15. An Ultimate Party Pack for £17.99, which includes 12 colours, as well as 2 brushes and glitter! This pack can paint up to 60 faces – perfect for a party! A rainbow kit for £13.00, which contains 8 colours and one brush. The kit caters for up to 50 faces – again, great for parties and for babysitters wanting some ‘fun’ ammunition for their sits! For the majority of face paint designs, you’re going to need black and white face paint. Both colours are crucial for line work and perfecting finer details. Diamond FX’s black and white face paints are market leaders. This is largely due to their high quality, but also because they are great for painting over other colours. They rarely, if at all, smear – perfect for the designs we listed earlier. There are loads of online shops that stock Diamond FX face paint, so go ahead and find the one that’s right for you. Whether you’re a sitter wanting face paint for short-notice sits, or a parent wanting some for the school holidays, ordering online isn’t always an option – we can’t always wait for delivery! There are various stores in London that stock face paint – these are usually craft and fancy-dress shops. They sell individual paints ranging from £3.99 for a 15ml pot and £5.99 for a 25ml pot. Oddballs stock Snazaroo face paint. They sell individual colour pots for £4.00, as well as kits (such as Halloween) for around £12.99. So High Soho stock Snazaroo 18ml pots, and sell them for around £4.50. We recommend finding the design you want to paint, watching some tutorials, and ordering your brushes etc based upon that. Sponges are a must. They are essential for creating base layers, smudging, and shading. We recommend getting around 4 sponges – you can cut them in half to make them last longer! There are a number of different sized and shaped brushes out there. #2 round brush (perfect for finer details and getting in difficult spots such as eyelids etc). You can buy a larger brush to cover bigger areas, although sponges work just as well! You’re going to need to rinse your sponges and brushes somewhere! Glitter makes everything look better, right? So, if you’re work of art isn’t looking exactly like a work of art, throw some glitter on! It also makes the perfect addition to princess and butterfly designs. Make sure you use makeup glitter rather than craft glitter. Stencils are great for painting stars, flowers etc. It also means you don’t have to paint them freehand, phew. Great for getting face paint off at the end of the day! Equally, grab a wet sponge and wipe your masterpiece away! Make sure your paint is safe for the skin! Most importantly, have fun and experiment! Throwing a party and need a professional face painter? The International Face Painting Association has a list of members on their website who you can contact. 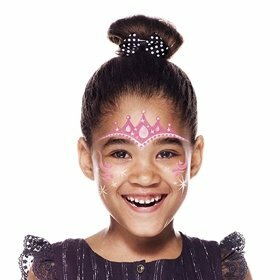 netmums also has a great list of local face painters. Just click on their face painter listing and search in your local area. Prices vary depending on how many children and the length of the party – just get in touch and they’ll give you a quote! It seems all that’s left is getting your child to sit still – we’ll leave that one to you! Send us your finished designs via our social media pages and we’ll repost them!